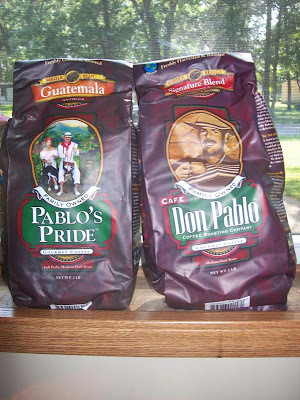 When I saw Cafe Don Pablo's Coffee on another blog, I knew that I would like to try it. I was sent two 2 pound bags of coffee for review. I got the Guatamala coffee and the signature blend. They both are very delicious, fresh tasting, and flavorful. This is a coffee that you are going to want to try for sure! The coffee is very affordable at $10.99 for a 2 lb bag! Giveaway: Cafe Don Pablo will be giving away a 2 pound bag of coffee to two lucky readers! The giveaway is open until Midnight on Thursday August 26th. Winner will be chosen on Friday August 27th using Random.org. Mandatory: Tell me the kind of coffee on Cafe Don Pablo's that you want to try. -Like Cafe Don Pablo on Facebook (2 entries). I would like to try the artisan blend. I found your giveaway at Ten Talents, This for That. I'm already a follower but thought I could enter some giveaways to help out! I like Cafe Don Pablo on facebook. I would like to try the Brazilian Santos. I'd love to try their signature blend! I entered your lipo in a box giveaway! I would want to try the "Classic Italian Espresso"
I would love to try the Artisan Blend - hmmm sounds great! I'd like to try the Signature Blend. Thanks! I would like to try Pablo's Pride - Decaf - Drip Ground. I would love to try Genuine Guatemala Antigua coffee. It's nice and strong. I subscribe to your feed by google friend. Entered your •Sweetriot Cacao Nibs giveaway. I think the Classic Italian Espresso sounds great! I would like to try the Signature Blend. I found you through This and That at My Ten Talents. I like the Classic Italian Espresso! I entered the Beyond a Salt Shaker giveaway! I entered the Lipo in a Box giveaway! I entered the Neo Strata face wash giveaway! I entered the Sweet Riot Cacao Chips giveaway! I found this site through the Survey Junkie Review Linky! I would love to try the ethiopian harrar, and found her blog through google search for don pablo. found ur blog from a friends blog. I love strong coffee and the Classic Italian Espresso looks so good!! Just ground some medium dark roast for my espresso machine and the aroma is wonderful.No other coffee has perfumed my kitchen with a rich aroma as Don Pablo did.